Errol Stone is an unlikely hero. Ignorant of the world outside his village, he does odd jobs to pay for his next drink, including carrying an urgent message to the hermit priest who lives in the hills beyond the village. The dynasty that has ruled the kingdom for over a thousand years has ended and a new king must be chosen, but there are some who would do anything to stop the ascension. Errol, the priest, and some companions must flee the assassins hunting them. VERDICT This fast-paced fantasy debut set in a medieval world is a winner. Both main and secondary characters are fully drawn and endearing, and Errol’s transformation from drunkard to hero is well plotted. Carr is a promising CF author to watch. Fans of epic Christian fantasies will enjoy discovering a new voice. Patrick W. Carr’s debut novel is a thrilling and fantastical medieval journey, whose unlikely hero discovers an impossible destiny lies before him. 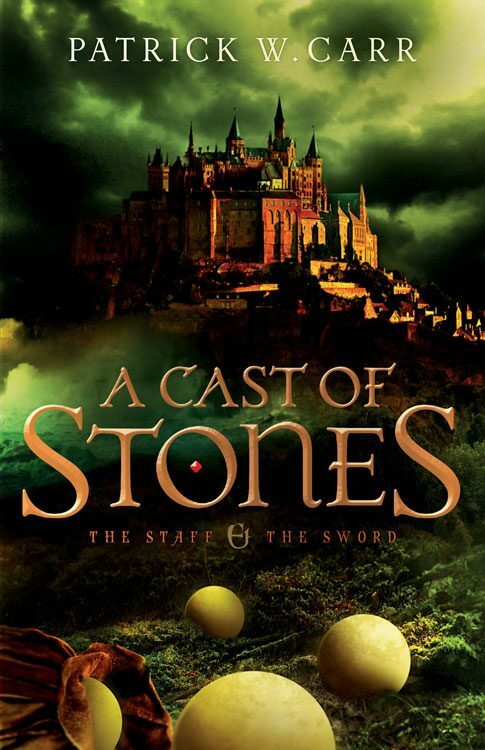 Very well written, A Cast of Stones runs with familiar themes but in a fresh and engaging way, with an underlying spiritual allegory. An always inebriated Errol Stone finds himself pursued by an assassin, ridiculed and dismissed by all who meet him, and eventually caught up in an adventure he can’t begin to fathom. Patrick has created a wonderful character in young Errol, a boy easy to cheer for as he joins a motley crew of travelers headed far away from his village of Callowford. As Errol discovers his companions and pursuers are not exactly whom they appear to be, danger creeps ever closer and Errol must find his wits and accept instruction if he is to survive what is to come. With plenty of deftly written fight scenes, captivating adventures, and meaningful and witty dialogue, Patrick has hooked me on this series and A Hero’s Lot can’t come soon enough. A Cast of Stones is an astounding story of monumental and epic proportions. Patrick W Carr has birthed a delicately intimate tale of a fragile hope that is desperately and savagely sought after while being drowned in intrigue, mystery, and deadly surprises that will leave you twisting in circles trying to keep up with all that is going on. His writing is captivatingly original and fresh. It will draw you in and snare you into never leaving the beautifully deceptive and ever surprising wonderland of Carr’s imagination. As the story unfolds before us, we meet and get to know Errol Stone, a peasant who has chosen to lose himself in the ale bottle rather than face his past which is full of his deepest hurts and darkest fears. We stand by and marvel at the slow and yet profound transformation that he goes through from a malnourished, uneducated, and fearful boy into a purposeful, strong, and courageous man. Not only does he get sober and stay clean, but he also becomes the man he was always meant to be and so much more. He is finally set free as he begins to learn about who he really is and picks up the mantel of his destiny. No longer is he ruled by his fears, but instead he is driven by his desire to know all that he has hidden from. His life now has meaning, and he can feel the rhythmic beating of his heart as it is pushes him passionately and fearlessly onward and forward into the unknown from the only home he has ever know. This is a story about much more than hope and destiny. It is a story about every man and how we are chosen to complete a special task that only we can do. It is a saga that we all must painfully endure as we clumsily and ungracefully grow and develop into who we need to be in order to fulfill the plan for our life. Thankful that our lives can be covered with mercy and grace if we ask for that blessing, we can use that as our cornerstone to keep us grounded and stable as we pass from one phase of our life into another coming closer to the ultimate goal of living our life unafraid of the unknown, unashamed of who we are, and confident that our next steps will be guided and guarded even if we fall. The people that Errol meet along the way are infinitely intriguing and serve as his teachers to a student who has long ignored his training. Some of his teachers become wise and cherished mentors while others prove to be dangerous and deadly mysteries that he learns to unravel and overcome. The depth and breadth of these characters are considerable and their impact will stay with you long after the journey has ended. Each one offers an important and thought-provoking lesson to learn, so that we can store them in our hearts for just the right time. A wise piece of advice is that people and things in our life aren’t always what they appear to be, so we need to see with eyes of discernment, listen with ears of grace, and speak with the tongue of love. We need to be wary of those who would stand in our way and embrace those who would journey alongside us and help to keep us walking straight on our treacherous and narrow path. We need to eagerly accept the teaching of the wise and carefully measure the words of the questionable. While blind faith may be required at times, a sharp and penetrating mind is an invaluable asset. Errol’s path from his hometown to the central city of the kingdom is one wrought with danger, mystery, and too many secrets to count. Even after reaching the central city where he believed his purpose would finally be fulfilled, he disappointingly finds that he has only just started on his path to fulfill his destiny. While blindly and unsuccessfully navigating through the politics of the king and the church, he finds his life in almost constant danger as unseen and unknown enemies try to stop him and his work at all costs. This he finds is due to the fact that their kingdom uneasily rests on an impossibly delicate balance due to the old king having no heir to take the throne while the church prepares to help “choose” his successor, and Errol’s role is inexplicably and unfortunately caught in the middle of this sticky situation. Anything can happen during this dangerous and tumultuous time, and that doesn’t bring visions of sunshine and butterflies to his mind. We need to be willing to help those around us even if it means laying down our own desires in order to help those around us. The only things in life worth doing are the ones that involve humbly serving each other. That is who we were always meant to be. Our heart isn’t truly happy when we only serve ourselves, and our hands get us in trouble when we focus only on our own desires and needs. We need to stop fighting our calling of service and self-sacrifice and just give in to the soul-fulfilling destiny that is patiently and softly calling our name. Even if our purpose is filled with more pain and suffering that we hope for, we need to take comfort in the knowledge that we are doing what we are meant to do, and in that doing that, things will work out just as they should. This story has left a unique and indelible fingerprint on my heart, and I eagerly anticipate the next book in this trilogy. I have fallen in love with the world and time of Errol Stone, and I can’t wait to delve into it again and continue to watch the drama of his story unfold into greater detail and become clearer until all is unveiled and each mystery has been revealed. Patrick W Carr is quickly becoming one of my favorite authors, and I would recommend him to everyone who enjoys being transported to a wondrous land filled with a myriad of both devious and kind-hearted characters that will transform you into a different person then when you arrived. The Hero’s Lot is a spellbinding, edge-of-your-seat thrill ride that will leave you breathless and reeling from the truly masterful and immensely pleasurable writing of Patrick W. Carr. 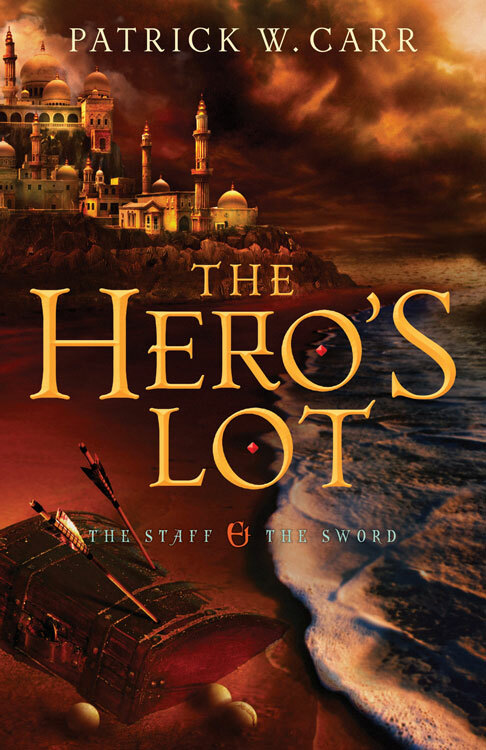 The Hero’s Lot is a captivating tale of hope amidst despair, life amidst death, and love amidst hate. The complexity of this story is quickly unraveled by the simple truth of faith. The beautifully crafted characters are rich with depth and overflowing with life as they come alive through the pages of this exquisite, heart-wrenching story. As we catch up with our hero, Errol Stone, we find him once again inadvertently and yet forcibly placed at center stage. He is handed a judgment to fulfill or he will be faced to endure a greater punishment. As with the normal progression of our hero, he is taken advantage of by those in power who wield the law like a seasoned soldier wields his sword in battle. Errol is forced to face who is he is again, but this time, he has something precious to lose. He must find out what kind of man he is as he comes face to face with the secrets of his past. His choice is taken away as it always seems to be, and the little power he thinks he has is ripped from him as he decides if his life is worth living and if he has the heart and the will to prove that he is worth more than some deem him. My heart broke each time Errol’s heart was laid bare before all to see and his life was continually colored with a shadow that shifted each time he desperately tried to focus on finding the answers that eluded him. I agonized with him each time that he was destroyed and remade by the path that he was destined to walk. His resilience to the pain and reshaping of his heart was truly awe inspiring. The human heart has a remarkable way of fighting through the gloom and the pain to remind us why we need to live. Errol tried to make the best of what those around him forced on him. He complained and wished for an easy road, but in the end he always did what was required of him. This is the example that we should all desire to strive for – quiet persistence amid a storm of questions, doubts, and trials. Readers of fantasy and epic adventure will enjoy every second of this beautifully crafted, mesmerizing story that is rich with intriguing characters, magnificent landscapes, and compelling questions. The only disappointed reader will be the one who never reads The Hero’s Lot for they will not experience the awaking of the heart and the soul in this unforgettable journey. A Draw of Kings is an epic journey full of heart, pain, and discovery. It is brimming with twists and turns that will keep even the fussiest of readers completely entertained and engaged. It is a story filled with the passion and desperation of righting an ancient wrong. Throughout this pursuit, we have our hearts ripped out, destroyed, and then remade into something unrecognizable in its beauty and wholeness. This is one tale that will wrap itself around your heart and will refuse to let go. If the first two books in this trilogy had you tearing your hair out with the unfair events that shake up and obliterate Errol’s life, then you are in for a big shock with this final installment. Not only do the dangers increase for Errol, but other major characters like Liam, Adora, and Martin are put through their own grueling perils. Sacrifice and mortal danger reach a whole new level as the imminent threat to the country of Illustra becomes reality. Only a miracle can save them, and that’s exactly what they strive to provide before the dying gasp of their nation’s demise. We finally see the conclusion to the heart wrenching and beautiful transformation Errol has undergone throughout the series. The refinement of his character is coming to its completion, and the fires that he must endure are beyond what most could tolerate. His character possesses a depth that even he is not always aware of. What he becomes is so far removed from where he began that you will swear it is not the same person. This is just like God to take someone that we deem as worthless and show us just how valuable and beautiful he/she is to Him. Errol wasn’t the only character that we see undertake such a drastic change. Adora, the church of Illustra, and others are walking their own paths to radical change and refinement. We see just what these characters are made of and what they must endure for the survival of their kingdom. I thoroughly appreciated their complexity and the resolute courage and faith that motivated their actions, even when they had nothing left to give. There are numerous lessons and layers to this story, and it requires that you take time to allow it all to soak and settle into your mind and your heart in order to fully appreciate everything that takes place. The level of craftsmanship of the story itself left me completely astonished, and I can say with surety that this trilogy will always have a special place in my heart. 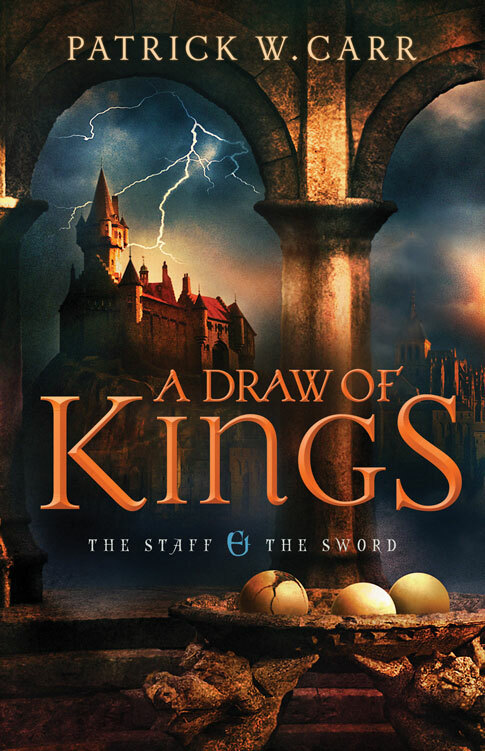 Patrick W. Carr has taken me completely by surprise with The Staff and the Sword Series. I was not expecting the magnitude of the treasure that it is. To say that I loved it would be a huge understatement. This is a series that is sure to touch the hearts of everyone who reads it. There is no way you can read this story and walk away unchanged. The raw power and quiet force of this masterpiece is literally world changing and heart transforming. I dare you to read Errol’s story and come away unchanged.